Why the Des Moines Menace Represent Everything That is Right with Soccer in America. Everyone expects Sporting KC to wipe the floor with them tonight. Even Adrian Healy, in his heart of hearts, must know. Surely he must. This team of amateurs. This team of school boys. This team of hopefuls and maybes and never will bes. Tonight, in their US Open Cup game against Sporting Kansas City of Major League Soccer, the Des Moines Menace of the PDL, collectively, haven’t got a chance in hell. But… what if they did? What if the impossible happened? What if they won? Like most team pages, the first section in the contents bar is club’s history. Not a big deal. Only, in the case of the Des Moines Menace’s Wikipedia page, their history entry is 2,779 words long. That’s just the entry on the team’s history! Not only does that crush SKC’s page, it crushes the pages of most EPL teams. Of course, anyone can edit a Wikipedia page. Are we really to take draw conclusions from website that allows, among other things, this? In a word. Yes. Because the Des Moines Menace’s Wikipedia page is a clear indication that there are people out there who really, really, care about this team, and as any support of soccer in the US will tell you, the dreaded specter that stalks our beloved sport in the night is not losing or disappointment, it’s apathy. So the Menace have a ridiculous Wikipedia page. So what. So this. His name is Kyle Krause, and his chin will eat you for friggin’ breakfast. So the team has a dedicated owner with a good chin. A really good chin. And the team has good fan support. So what? So this. It’s an oil painting of Mike Jeffries. At least I think it’s oils. It could be acrylic. The point is, where’s your painting of you? Oh, that’s right, you don’t have one. Because you’re not Mike Jeffries! (Mr. Krause, if you are reading this, I’m sure you have an oil painting of yourself too. Please excuse the above sentence aimed at lesser readers.) This swarthy, painted gentleman was not only a Herman Trophy winner, not only the head coach of the Dallas Burn, not only a scout for Bob Bradley’s 2010 World Cup Team, not only a trophy-winning MLS assistant coach and double major in Electrical Engineering and Public Policy… he is the head coach of the Des Moines Menace. And he is the coach of the Des Moines Menace because he loves developing young players; and I don’t have a direct quote from him either but suspect he also relishes the opportunity to be a head coach again for an organization that truly appreciates his dedication to his craft. The fact that Mike Jeffries, with his resume, is coaching in the PDL, is a sign of just how far our sport has progressed since the good folks in Manhattan thought it wise to name a pro soccer team after an uncomfortable physical condition (and I’m not talking about the Wiz). So the Menace have a head coach steeped in American soccer history with connections all over MLS and a passion for developing young players. So what? So this. You’ve never heard of Matt Homonoff, but chances are you have never savored your team winning the way Matt savored the Menace’s Open Cup victory over Minnesota’s NASL team last week. You’ve never savored a victory like he did because chances are you’ve never put in an 80-hour work week, or a 2,500-hour work year, for “your” team. Chances are soccer is a game you love, but it doesn’t put food on your table. But for guys like Matt, guys (and plenty of women too) who are in the trenches of selling tickets and booking sponsorships and securing venues and managing the hundreds upon hundreds of small and mighty details that go into making soccer a reality in this country, there is no off season. Soccer is a game that is lived, day in and day out. 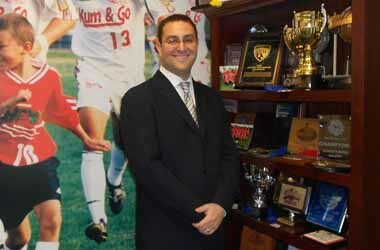 And all of this bears mentioning because contrary to what some might believe, there is an army of people like Matt out there doing everything they can to grow our game, and the fact that a team in the fourth division of soccer in this country has a GM with the chops of Matt Homonoff says an awful lot about how far our sport has come. That’s right. Matt has serious chops. He’s also eaten a few chops in his day. Lamb chops. That’s okay. It’s not his job to be svelte. He’s a GM. The Menace are a fourth division team with a passionate GM. So what? So this! My God, he looks like he’s 12 years old. This, ladies and gentlemen, is Brandon Fricke. He grew up in a little place called Grimes, Iowa, which is, according to my sources, the single most Midwestern place in the entire universe. Young Brandon just wrapped up his sophomore year as a defender for Butler University and now plays his summer ball for little club called the Des Moines Menace. It was his goal, in the 86th minute, against the NASL’s Minnesota United FC, that propelled the Menace into their game against Sporting Kansas City. He is also the former captain of the Iowa ODP team. Isn’t that special. Local boy does good for his local PDL team, setting the stage for the impossible task of playing against the team who developed him in the first place! That’s right. Brandon Fricke is actually a former member of the Sporting KC Academy program. This is poetry, people! Poetry!!! Perhaps, in the near future, once Brandon has earned his degree in, we can only assume, dimples, he will pursue a professional career in soccer. But until that day comes, he is a member of an amateur PDL squad going against the big, bad Sportings from Major League Soccer, trying to show his old team that he still has the talent and drive that caught their eye so many, misty years ago, and with all that being said you can’t tell me you’re not rooting for the kid, or his team. And the truth is, every player on the Menace has a backstory that is just as compelling. So let’s review. A dedicated owner in it for the love of the game. The most dedicated fanbase in all of amateur soccer. A head coach returning to his player development roots. A GM who represents every unsung hero of US soccer’s ascent over the past 20 years. A roster full of redemption stories and half realized dreams, all clawing and scratching their way towards the light of a pro contract. No. The Des Moines Menace do not stand a chance against Sporting Kansas City. Not under the lights of Sporting’s $200 million dollar stadium. Not under the withering glare of the amateur/professional divide. But if they did? If they somehow, somehow did. What if Kamara hits the woodwork three times in the first half but can’t finish; then, Kansas City native and former MLS League Pool GK Scott Angevine has the game of his life and keeps the Menace in it until the 65th minute when SKC’s Besler-less backline botches an offsides trap, putting Des Moines’s Jimmy Tulloch in one-on-one against Jimmy Neilsen who has momentarily lost focus pondering the wisdom of releasing his autobiography midseason; Tulloch scores, tells the SKC fans to quiet down, and the Menace go on to hold their improbable lead for the next 29 minutes in a flurry of defensive heroics that include Fricke’s dimples and Krause’s chin making three goal line clearances in stoppage time. However it happens, if the Des Moines Menace of the PDL win tonight against Sporting Kansas City of Major League Soccer, it will not be a sign that the sky is falling on our beloved game. No. It will be a sign that the Soccer Gods, the same Gods that have steered the fates of so many other underdog clubs around the world, in tournaments just like this, have finally seen fit to visit our shores. If the Menace win tonight, the victory will be etched in the minds of soccer fans for years to come. In the little town of Grimes, and the not so little city of Des Moines, it is a story that will be told for decades. If the Menace win tonight it will be a sign that our beloved game has finally begun to develop more than just players… we have begun to develop legends.